I had been reading reviews of the new Hunter tool for cutting end grain and liked what I saw, although it was out of my price range when you considered the extra charges for importing one into the UK. I then saw the advertisement for a similar tool that had recently been introduced by Simon Hope and the opportunity came to try it - I can only say 'superb', particularly when you consider it is far less expensive than some other versions. 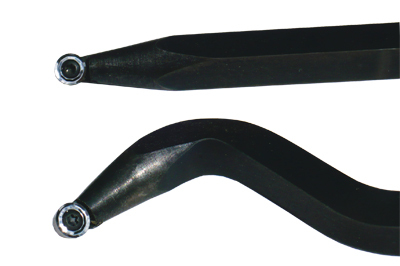 There are two tools available - one straight and one with a swan-neck profile - and although these are sold without handles, the ends are machined to 9.5mm rounds which will fit most 10mm handles on the market today. You can always make your own handle. The shafts are 370mm long and are made of a 12mm square steel bar which lays flat on the toolrest as you are cutting. 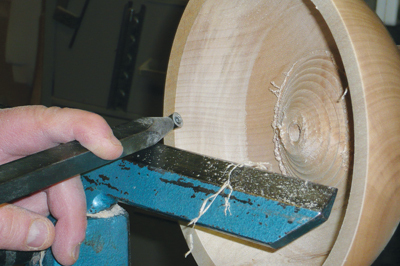 The cutting end is round tapering down to accept a 10mm carbide cutter set at a 45° angle which is perfect for cutting end grain and can be used in a left or right direction, the square shaft on a different face allowing the cutting angle to be maintained for either direction. The tool is a joy to use and keeping the shaft flat on the toolrest means that you are unlikely to get anything other than a perfect cut. I cut the inside of a 200mm diameter bowl using this tool and there was absolutely no torn out grain. Perfect also for boxes and cross grain hollowing, this tool makes a really useful addition to your tool kit. The cutters are not meant to be sharpened and doing so can make the cuts worse. When you feel that the blade is dull, loosen the Torx holding screw and rotate the cutter by 90° for a completely new edge. Spare cutters cost Â£15 but you shouldn't need to replace them that often. This tool is perfect for the beginner or advanced turner. I absolutely loved turning with it. I would definitely recommend them.